A new home for a rare vintage driver. The story begins as this type of stories often do: a captivating image on the net that continues to bother until something’s done to the bewilderment and anxiety. The next step was that a pair of mystical loudspeakers arrived at the door step. Inside the shipping cartoon were two mobile and foldable speakers with a single element. Here’s the new acquisition on the floor. The question is about not insignificant Klangfilm KL-L405, which a number of vintage-oriented hobbyists have experimented in their own designs. 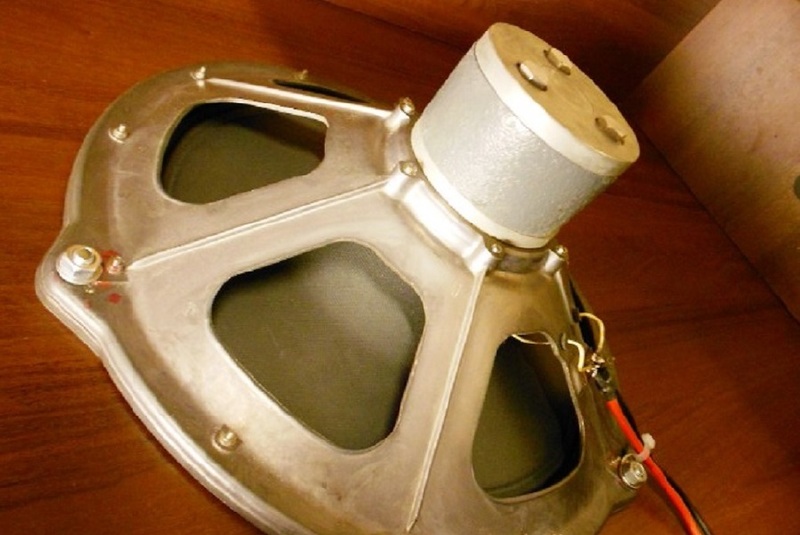 The Klangfilm KL-L405 is a 14″ paper cone semi-full-range driver from the mid 20th century. 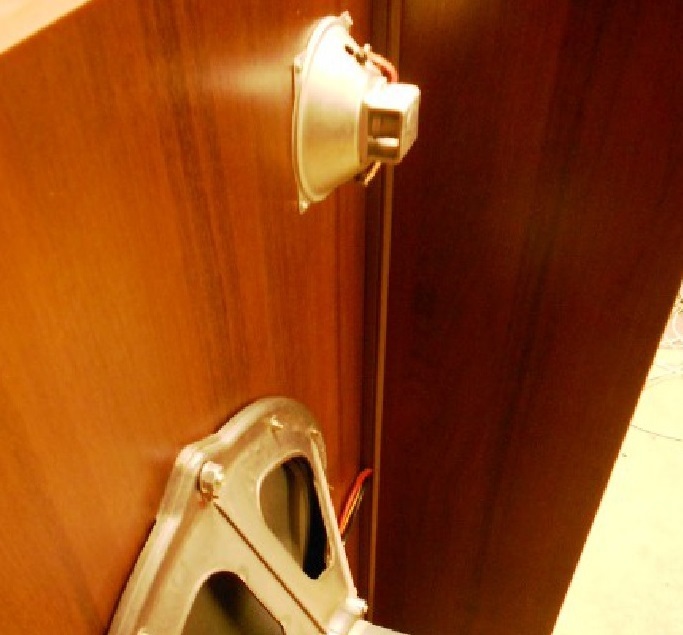 The carrying cabinet was open back, as the habit was at the time. The new owner decided to bring the drivers to a modern setting, which in this case meant a larger open back cabinet, and complementing the big driver with a relevant and congenial tweeter, if needed. The next graph describes the result from a distance of roughly one meter. As can be seen, the driver appears to require a tweeter even to reach the 10K benchmark. 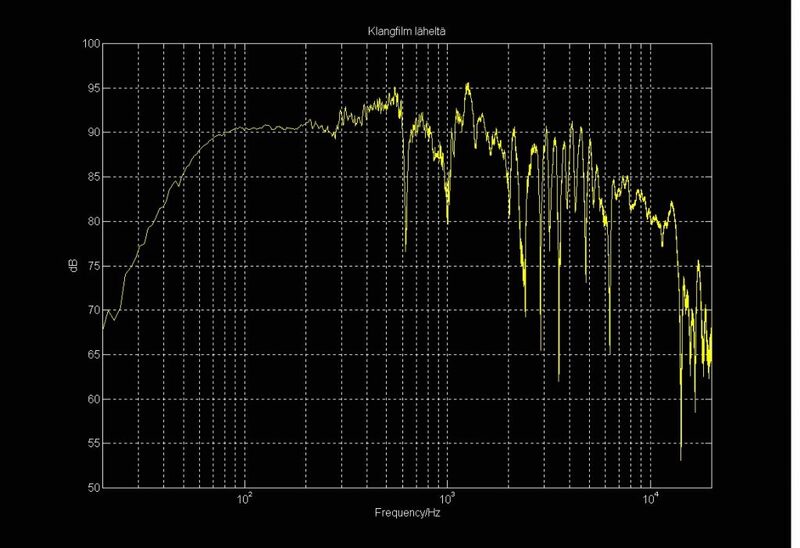 On the other hand, sensitivity is well beyond 100dB so that there’s quite a bit energy still at 10K even without a tweeter. If perfectly balanced against the bass extension, the driver can be tonally acceptable even without a tweeter, despite the fact that most of us would now want to add one. 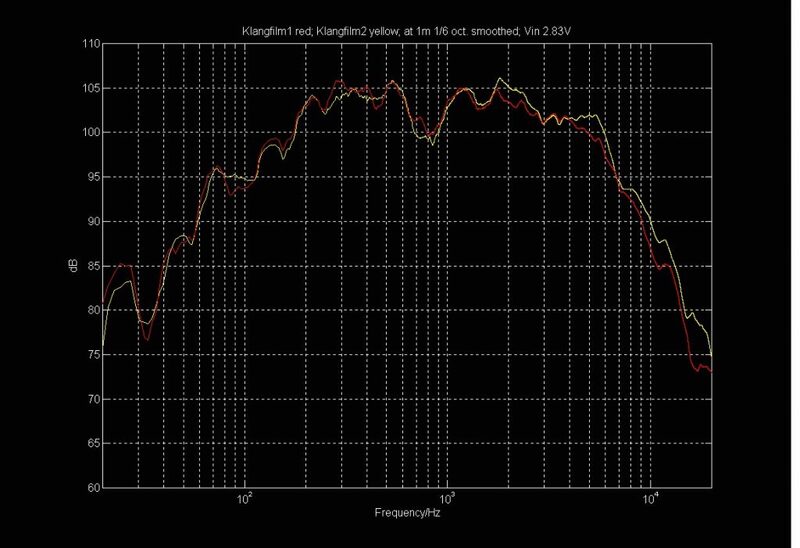 The dip around 1000Hz may need some EQ’ing. So next a tweeter was added, a Klangfilm cone tweeter, and for it a very mild crossover (by Veikko Luukkanen), the tweeter taking over around 7-9kHz. Otherwise the response of the KL-L405 was not filtered. 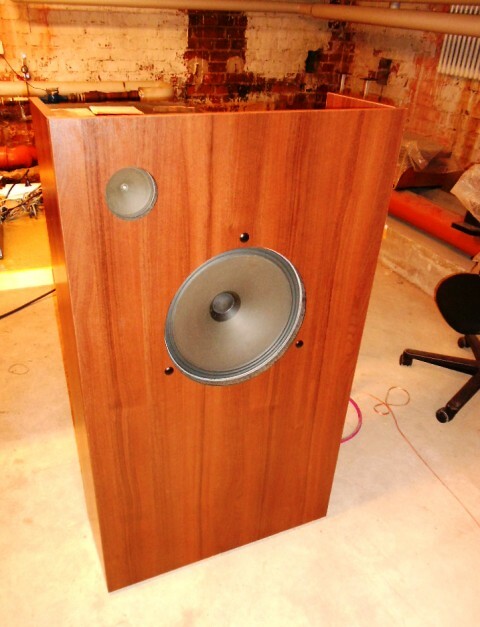 Here’s how the speaker looks from behind. 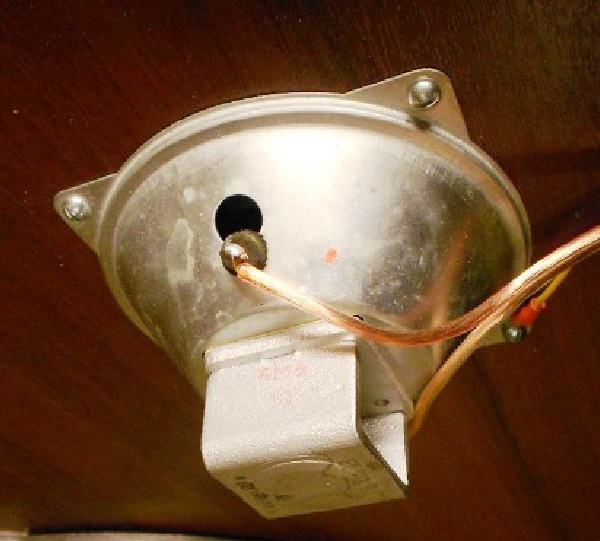 A granite plate was placed on top of the speaker to reduce resonances. For a brief audition, the speakers were first driven by a pair of Quad II mono blocks with no lack of power whatsoever. The sound wasn’t perfect from the outset but highly promising. It was clear like a day that there was a great potential in these drivers for a super fast and transparent sound. It won’t be easy to conjure a useful tight and controlled bass out of the baffles, but once that goal is achieved, the speaker will provide its owner with many many hours of happy listening. 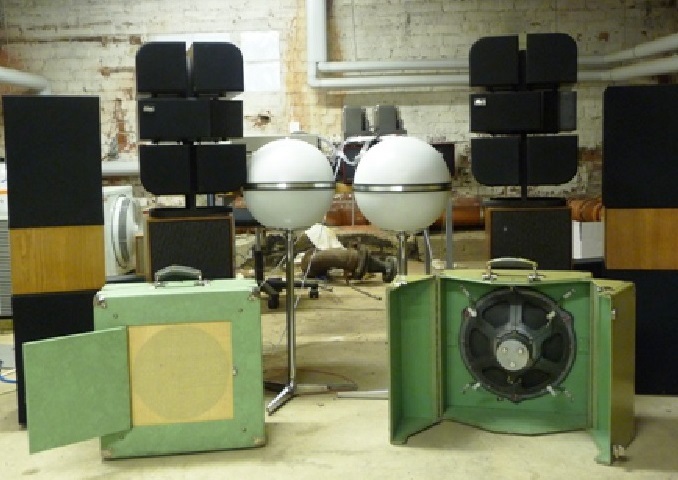 Concurrently there were other vintage speaker systems around such as big Beomasters and original Grundig Audiorama 7000 from 1971, the latter with four mid/woofers and eight tweeters inside a white ball! 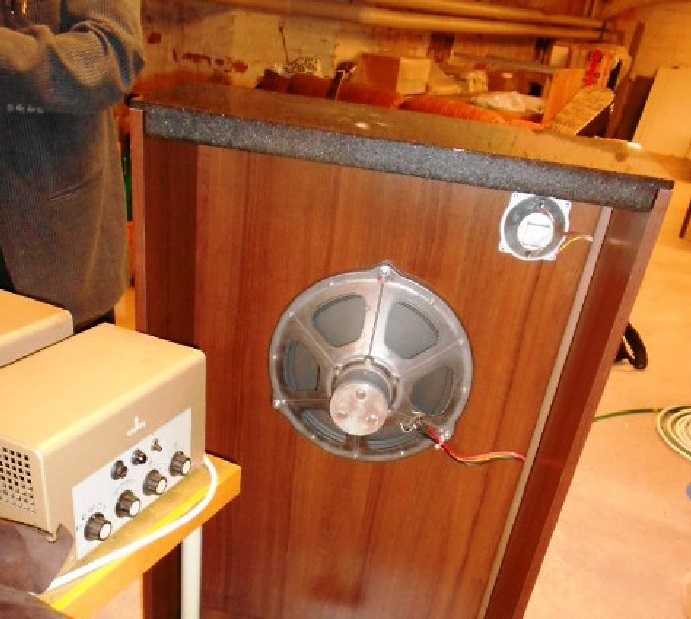 So I took a chance to listen to rarely seen Henry Kloss KLH Ten Model CT-38 featuring two 8″ mid/woofers (bearings repaired) and two 2,5″ paper cone tweeters. 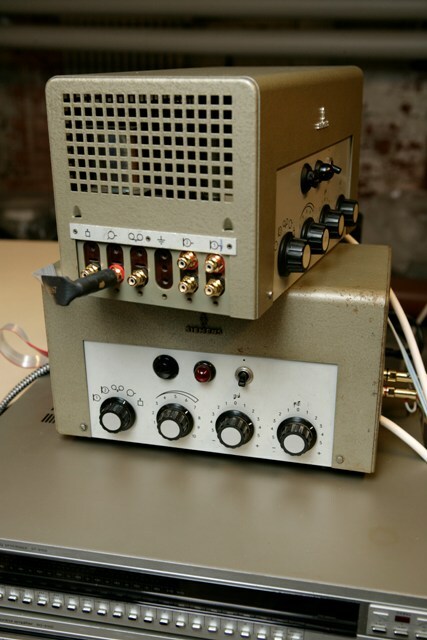 The 1970s speakers were connected to wonderful tiny Siemens tube amps to produce, with what was mainly jazz and classical music, a really delightful sound! No sonic artificialities of modern hi-fi. The two tweeters delivered a smooth and sweet but in no way dark or dim treble. The midrange drivers served and supported vocal music, and the bass that in itself was clearly sufficient, didn’t color the performance unduly. The listening cave was resonant, but apparently large enough not to disturb the direct sound providing a truly pleasant and relaxed listening moment.